My inspiration for this cupcake was from the cupcake recipe book Vegan Cupcakes Take Over the World. I thought about making them but that would require the use of margarine. I think margarine is all sorts of disgusting and refuse to buy it. I started googling recipes that weren’t vegan but wasn’t thrilled with what I was finding so I called my mom. She gave her recipe for hot milk cake. 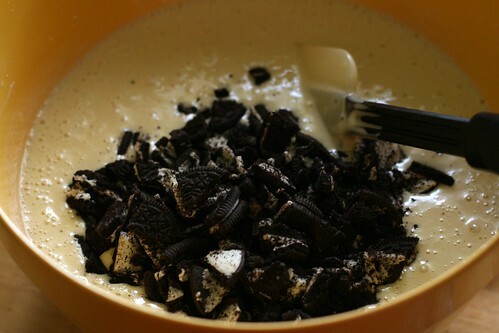 I used that and just added chopped Oreos to the batter. 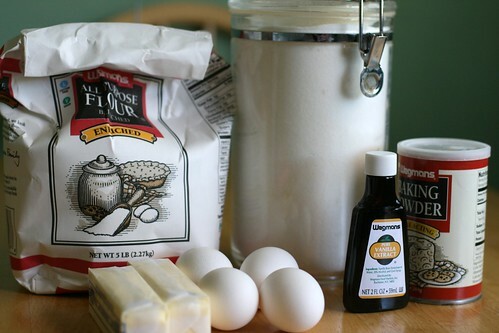 Confession: when I need to make a yellow or white cake I usually buy a mix. I’ve tried different recipes before and they always come out dry. Chocolate cake on the other hand is no problem for me with my family’s go-to chocolate cake recipe. When my mom read me the ingredients for this cake I thought it sounded too easy to be true. She said it’s the only yellow cake she ever makes so I figured I’d go with it. I have very few pictures of me making the cake because I was trying to do about forty-eleven things at once. My batter was almost done before I realized I hadn’t chopped any Oreos, my milk and butter were past the “just melted” stage and were nearly the “boiling over” stage. I took my largest knife and roughly chopped enough Oreos to fill a measuring cup, then I added some more. I didn’t think you could have too many Oreos. The batter is pretty thin and I was worried all the cookies pieces were going to sink to the bottom. But when I took them out of the oven I was pleasantly surprised! We all had one after dinner and from the insides of those three it seemed like all the Oreo pieces were at the top half of the cupcake instead of the bottom half. Kudos to my mom for giving me this recipe, they couldn’t have come out any better! Thanks mom!! 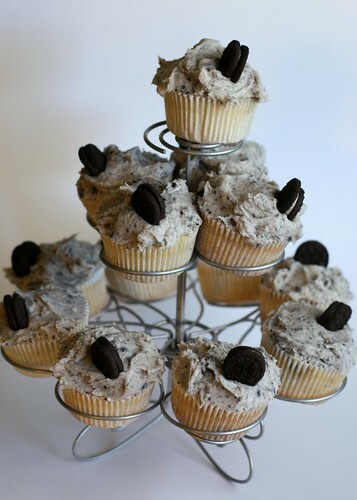 For the buttercream frosting I wanted to add some Oreos too. 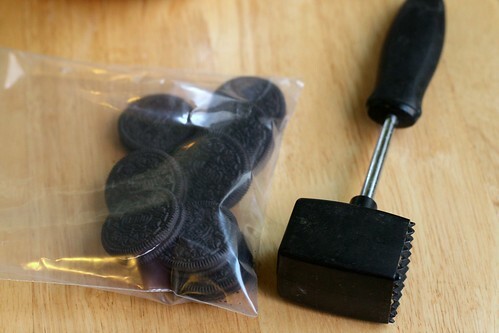 This time instead of roughly chopping them I threw some Oreos in a small ziplock bag and took my meat tenderizer to them. I pounded them until they were in pretty fine pieces. I did try to put the frosting into a pastry bag so I could pipe the frosting on but there were some pieces of Oreo that were just too big to come out of my 1M decorating tip. 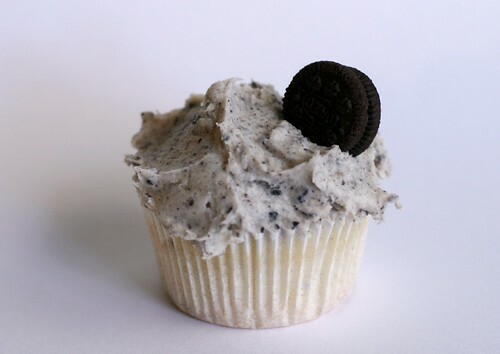 I slathered on a bunch of frosting on each cupcake and topped them with a mini Oreo. This buttercream tasted just like cookies ‘n cream ice cream. So very good! Put the butter and milk in a small saucepan and heat until just combined. Mix together the flour and baking powder together in small bowl. Cream together the eggs and sugar on medium speed until light and fluffy, around 5-10 minutes. Add the vanilla. Fold in the flour mixture. Add the hot milk and butter, stir until combined. Add the chopped Oreos. Fill lined cupcakes tins 3/4 full. Bake at 350° around 15 minutes. Cool on wire racks. Beat the butter and vanilla until smooth. Add around 4 cups powdered sugar until combined. 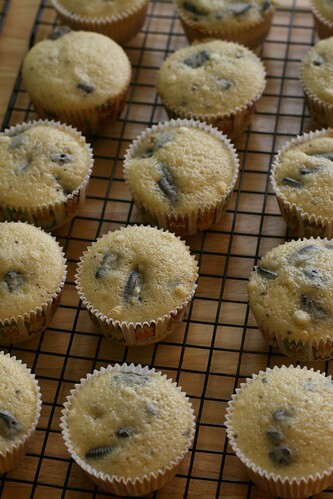 Add the milk until the frosting in the right consistency. If too thick add more milk, if too thin add more sugar. 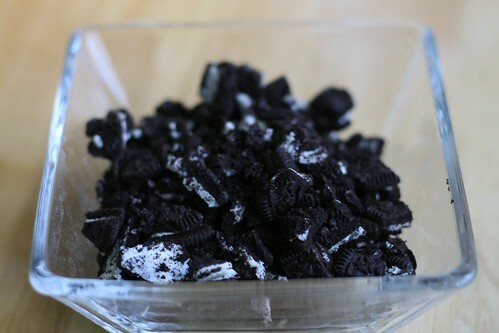 Stir in the Oreo pieces.